Thomas Rowlandson’s Dr Syntax was arguably one of the most enduring characters to emerge from the so-called ‘golden age of British caricature’. He first appeared in print in an 1809 edition of Rudolph Ackermann’s Poetical Magazine before going on to star in three full-length literary adventures of his own. 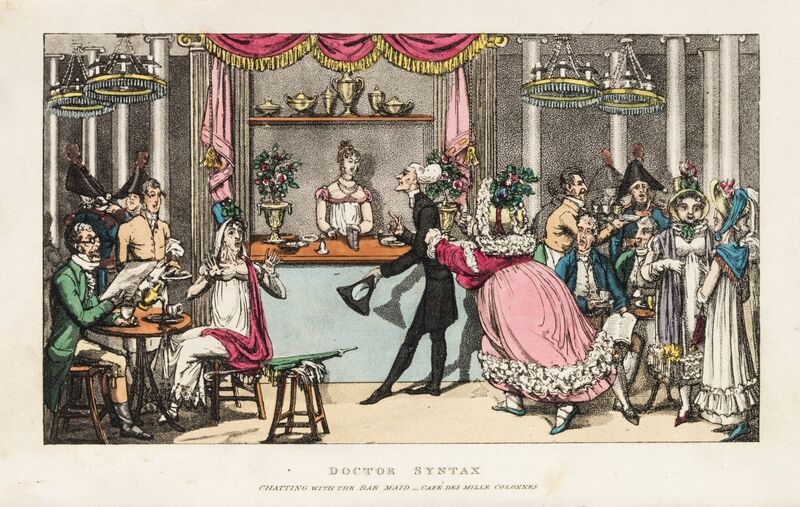 The three tours of Dr Syntax that were subsequently created by Rowlandson and the writer William Combe were hugely successful, running through successive editions and spawning a plethora of imitations and unofficial merchandise. The character’s popularity was to remain undiminished for several decades after its first appearance, with the original Rowlandson & Combe’s original Syntax adventures remaining in print into the Edwardian era. While the public’s appetite for more Syntax adventures may have remained undiminished, Rowlandson’s enthusiasm for the project was waning. 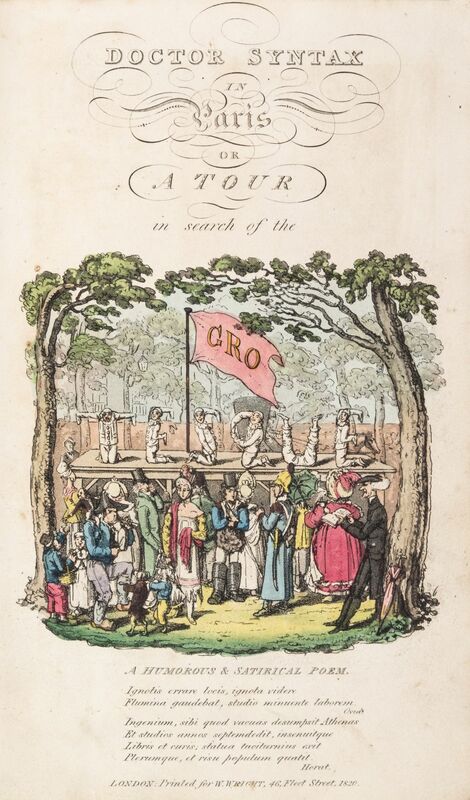 By the time work commenced on the third tour in 1821, he was providing fewer illustrations to accompany the text and relying heavily on recycled themes and imagery that could be dashed off with the minimum of effort. Although some of the plates for the final Syntax book betray flashes of Rowlandson’s comic genius, they are mostly rather uninspiring stuff that convey the impression of an artist who is going through the motions in order to secure a pay cheque. Pointedly, the third tour ends with Syntax’s death and burial, thus definitively ruling out the possibility of further installments. While Rowlandson may have been happy to leave Dr Syntax quietly decomposing in his grave, many of his artistic rivals had other ideas. The commercial success of the series had prompted a rash of imitations featuring Syntax, or some other wandering cleric that looked remarkably like him, being catapulted into another unlikely adventure. Most of these books were published in the years between 1815 and 1825 and carried titles such as The Adventures of Doctor Comicus; The Tour of Doctor Syntax through London; The Rich Old Bachelor; The Tour of Dr. Prosody in Search of the Antique; and A Domestic Tale, in the Style of Dr Syntax. The quality of these copies is variable and there are no contemporary sources to verify how they were received by the public. The relatively large number that were produced over a period of several years suggests that they were not unpopular, however low survival rates and the fact that most of them never made it beyond the first printed edition indicates that they were nowhere near as successful as Rowlandson’s originals. Syntax in rapture soon exclaimed / “I am really quite ashamed /… To have my late peregrination / By folly yclept ‘Picturesque Tour’ / Entrusted to such a clumsy boor /… I often weep for very shame / Each time I read the awkward, lame, / And puling, puerile, thoughts, in sooth / The booby’s put into my mouth. The story is a simple one – Dr Syntax and his wife journey to Paris, take in the sights of the city and get caught up in a few mildly amusing scrapes along the way. The humour is gentle, even by the conservative standards of Rowlandson & Combe’s original, and often derived from cultural faux pas or simply slapstick. 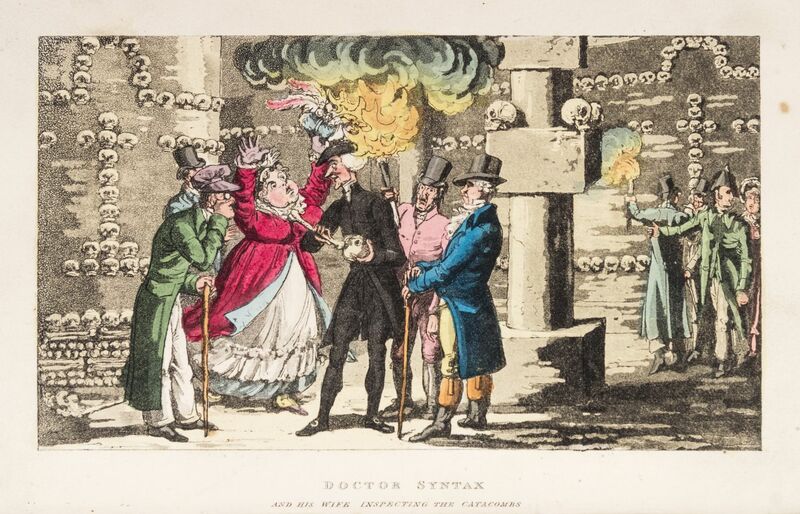 The chapter in which the Syntaxs take a tour of the Paris catacombs for example, reaches its comedic climax when Mrs Syntax’s hat accidentally catches light on a nearby torch. The most interesting aspect of the book for the modern reader are not necessarily Dr Syntax’s escapades, but rather the surprisingly informative footnotes that contain snippets of information on life in restoration Paris. For example, while assuring readers that the standard of hotels in France is generally awful, the author states that they do posses one advantage over their English counterparts in that they allow guests to consume outside food on the premises. In another he recommends that visitors take a turn on the ‘Russian Mountain’ – a giant wooden slide at the funfair on the Rue de Faubourg de Roule – in order to enjoy the view of Paris from the top. Ironically, the comparative scarcity of surviving copies of the pirated Syntax adventures often means that they are worth more than the originals. A good copy of Syntax in Paris may be expected to fetch something in the region of £150 – £250 at auction. 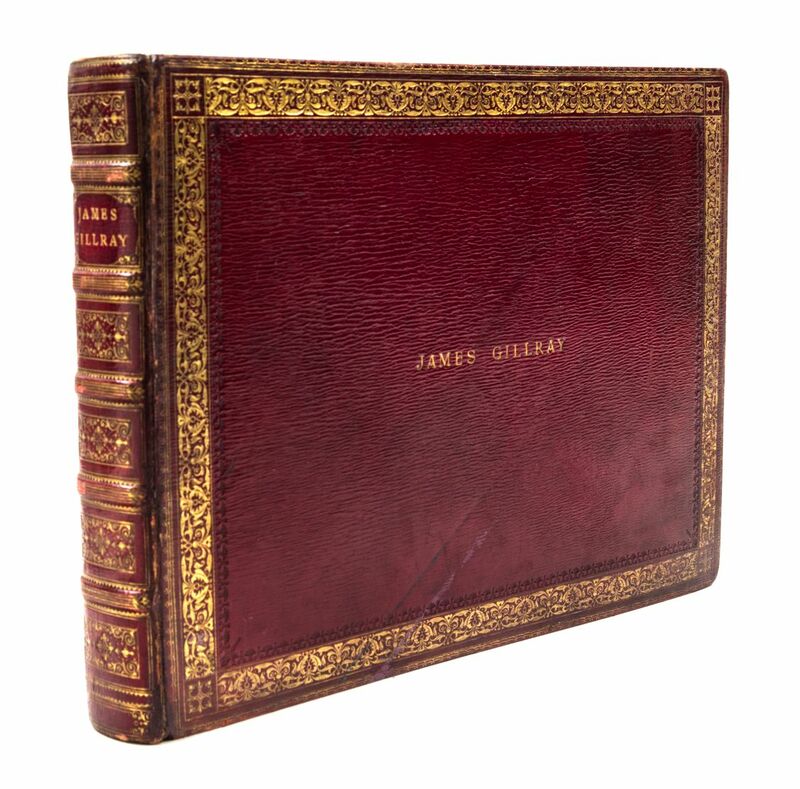 The Caricatures of Gillray; with Historical and Political Illustrations, and Compendious Biographical Anecdotes and Notices was a nine volume history of James Gillray’s works, published by John Miller of London and William Blackwood of Edinburgh between 1824 and 1827. It was one of four major posthumous editions of Gillray’s prints to have been published during the first half of the nineteenth-century, although it was the only one to have been produced using copied engravings rather than Gillray’s original copperplates. customers being able to choose from a range of binding and colouring options. The variations in colouring are particularly interesting, with the differences in the illustrations shown here (taken from two separate bound editions) indicating that customers could choose between a basic colour-wash, or finer hand-colouring that more closely aped Humphrey’s ‘shop’ colour. Nine volumes were published in all, each containing around 80 engraved plates accompanied by a short explanatory article. A tenth volume appears to have been in the making when the project was brought to an abrupt halt, forcing the publishers to sell the latest batch of engravings seperately. The reasons for this are not known, but given that large publishing projects such as this were usually funded on the basis of pre-sale subscriptions, it seems likely that Miller & Blackwood were unable to raise sufficient capital to cover the cost of publication or justify the risk of further investment. The series was almost certainly conceived as an attempt to provide customers at the lower end of the market with an affordable alternative to Gillray’s expensive originals. The printseller S.W. 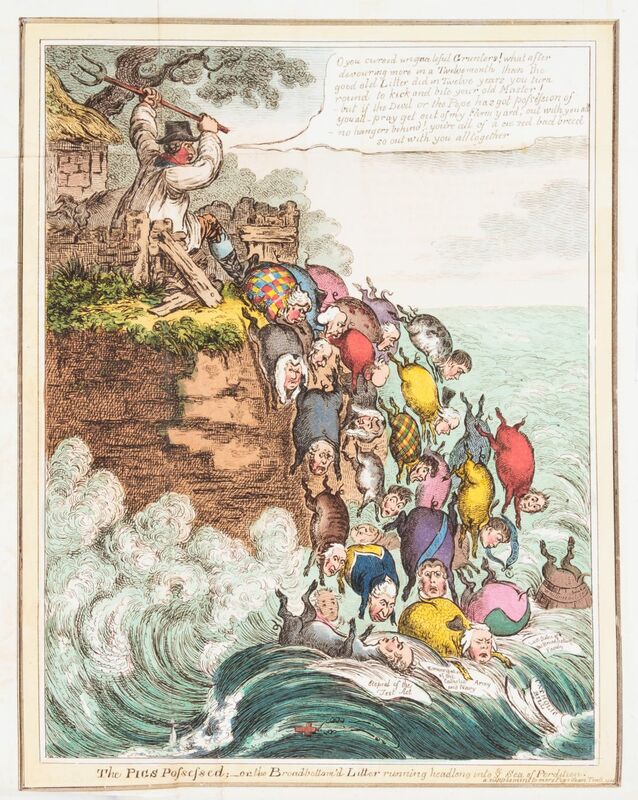 Fores had tried something similar in the early 1800s, paying the jobbing caricaturist Charles Williams to engrave a number of copies of popular Gillray designs which were then sold at less than the cost of the original. Miller & Blackwood simply took the scale of this piracy a step further, copying whole swathes of Gillray’s back-catalogue and selling them in cheaply bound and coloured volumes. Their methods may have been crude but they were undoubtedly successful, as the relative longevity of the series and large quantity of surviving prints indicates. The secret of their success is obvious – a customer walking into George Humphrey’s printshop in 1824 would have been expected to pay between 2 and 5 shillings for a coloured copy of one of Gillray’s famous caricatures. Miller & Blackwood on the other hand, could offer the same customer a bound edition of 80 coloured images for 10s 6d. It is a comparison which neatly illustrates the changing nature of the market for printed satire in this period and explains why so many of the older West End printshops began to diversify or disappear from 1820 onward. Surviving examples of prints from the series are still relatively common, and although individual plates carry very little financial value, bound volumes and complete editions can be worth several hundred or even a few thousand pounds depending on their condition. Another post inspired by my recent trip to Boston. I noticed that a large copy of this print had been used in one of the displays in the Old State House museum and it suddenly occurred to me that I had an original version sat in a drawer at home somewhere. And so here it is: The Political Cartoon for the Year 1775. I purchased this print on eBay a couple of years ago. 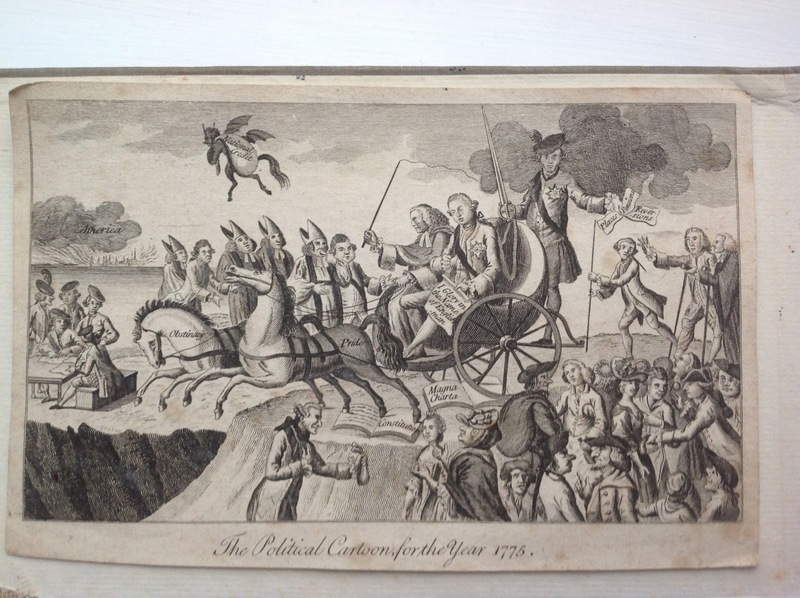 The seller had titled their listing somewhat clumsily (I’m being polite – they’d described it as an ‘American horse-racing print’) and consequently I was able to get this for a fraction of the price I’d normally have expected to pay for something which referenced the American Revolution. As a collector, these are possibly the moments that make life worth living. It was produced for the The Westminster Magazine or The Pantheon of Taste, a society magazine published under the auspices of a number of different London publishers between 1773 and 1785. The magazine was founded with the intention of providing a high-brow alternative to the popular Gentleman’s Magazine, a publication which many felt was becoming overly preoccupied with commerce, industry and the bourgeois business of making money. The Westminster Magazine would therefore provide those who still clung to the aesthetic sensibilities of the true English gentleman with reading material which focused exclusively on the world of the arts, philosophy and the polite sciences. The Cartoon was one of two plates that were engraved for the April 1775 edition of the magazine. The second being a portrait of the Scottish author and poet Dr Thomas Smollett by the engraver John Walker of Paternoster Row. Walker produced most, if not all of the prints used by the Westminster Magazine at this time and it’s likely that he was also responsible for etching this plate. The principle figure is a full-grown young man in leading-strings [George III], mounted in a curule chair, supported by the people, yet swallowing the beginning of a period, “I glory in the name of Englishman”. On one side of this lifeless charioteer, sits a Scorbutic Figure, in the habit of a Judge [Lord Mansfield], who constantly holds the reins, and who is furiously driving down a precipice, trampling over MAGNA CHARTA and the CONSTITUTION. Behind in a certain THANE [Lord Bute], scattering places, pensions and reversions. …The near prospect exhibits AMERICA in flames — UNIVERSAL BANKRUPTCY AND ANNIHILATION. The print proved to be quite prophetic, as this edition of the Westminster Magazine was published shortly before news of the fighting at Lexington and Concord finally reached British shores. The British press and public would continue to exhibit widespread hostility towards the government’s policy of using military force to subdue the American rebels throughout the early stages of the War of Independence. It was not until the colonies declared themselves independent, and then concluded an alliance with the hated French, that British public opinion finally turned against the Americans. Playing cards rank alongside hand-fans, snuff boxes and creamware pottery, in the list of ephemeral eighteenth-century items that were frequently decorated with satirical imagery. Packs of novelty playing cards would also doubtlessly have been among the many items which one could have purchased at any of the leading London printshops during this time. Playing cards had first appeared in Europe during the 1400s, and had become sufficiently commonplace by the end of the 1600s to necessitate the production of more elaborately decorated packs which could be distinguished from those of a rival retailer. The public’s penchant for decorated cards was such that, by the start of the 1700s, the decoration often covered almost the entire surface of the front-face of the card. This trend seems to have been spurred on both by the general explosion in the quantities of printed imagery being applied to all manner of paper goods in the years after the lapsing of the Licensing Act in 1695, and also by changes in the way in which card games were being played. Eighteenth-century card players literally kept their cards close to their chest – preferring to use a single hand to hold their cards in a very tight fan. This style of playing meant that the suit and value of the card had to be distinguishable while only revealing a fraction of the card’s surface. The solution was to place this information in a small box at the upper left corner of the card, leaving the rest of it free for some other form of engraved decoration. Satirical images appear to have been among the first decorative themes to appear on playing cards in England during the mid-seventeenth-century. This is not surprising, given that the hierarchical nature and courtly themes of card games so easily lends itself to the purposes of political satire. 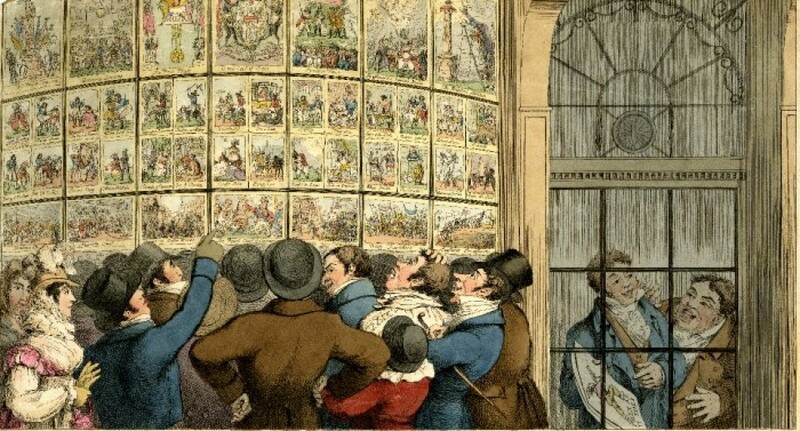 Studies of the history of card-playing also indicate that the very rules of the games which were being played could also be changed to provide a subtle form of political commentary. For example, it is said that the reordering of the value of aces, to replace kings as the highest value cards in the deck, coincided with the revolutions of the late eighteenth-century. 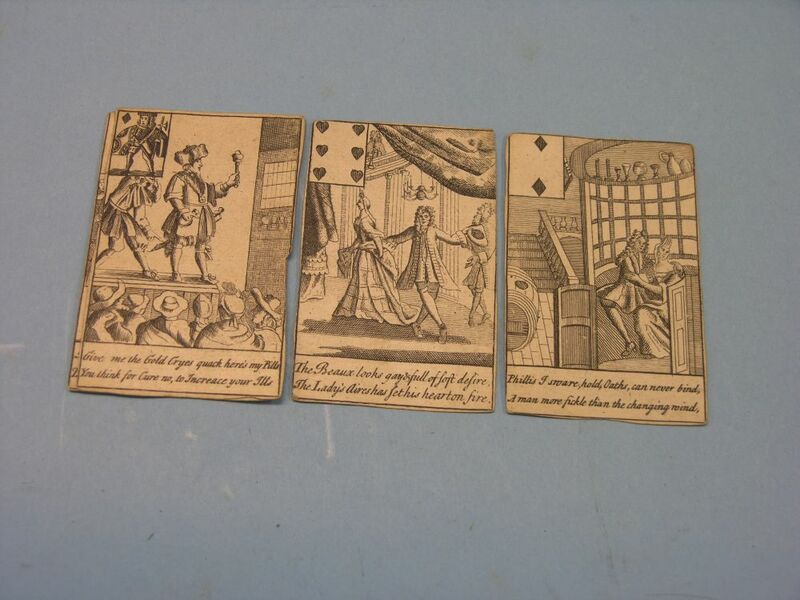 The cards shown here date to the first quarter of the eighteenth-century. Each one is decorated with an individual social satire on subjects ranging from young rakes, to gaming and the itinerant quack doctors that seem to have plagued the fairs of the English countryside. 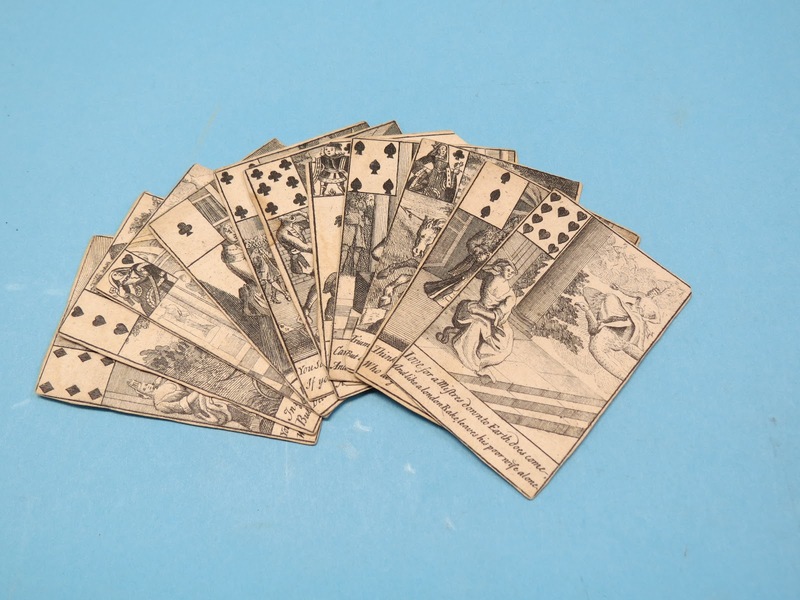 They were the surviving remnants of a deck of cards which was sold at auction in 2012. I forget how much they fetched at the time, but it would not be unusual to see them go for somewhere around £500. Their value being boosted by the fact that their appeal cuts across multiple areas of collecting interest. I’ve spent the best part of the last two weeks on holiday in New England. The trip included four very agreeable days in Boston, which provided an opportunity to take a first-hand look at some of the places that were intimately involved in the early stages of the American Revolution. While it is not my intention to go all Judith Chalmers on you, there was one particular tourist attraction that I stumbled on, quite by accident, while walking the Freedom Trail, which I’m sure will be of particular interest to readers of this blog. The Printing Office of Edes & Gill offers visitors to Boston a faithful recreation of a late eighteenth-century print works. 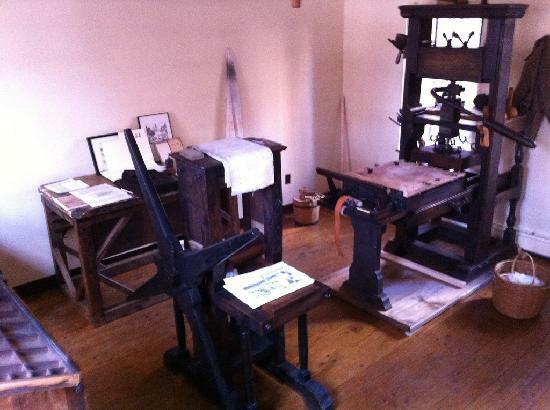 The workshop has been kitted out in accordance with the specifications set out in Jospeh Moxon’s Mechanick Exercises on the Whole Art of Printing of 1684, and contains detailed working replicas of a contemporary printing press and copperplate press. Needless to say, the proprietors know an astonishing amount about the mechanics of eighteenth-century printing and are happy to explain everything from the composition of contemporary inks, to the judicious application of felt wadding to prevent copperplates slipping during the printing process. 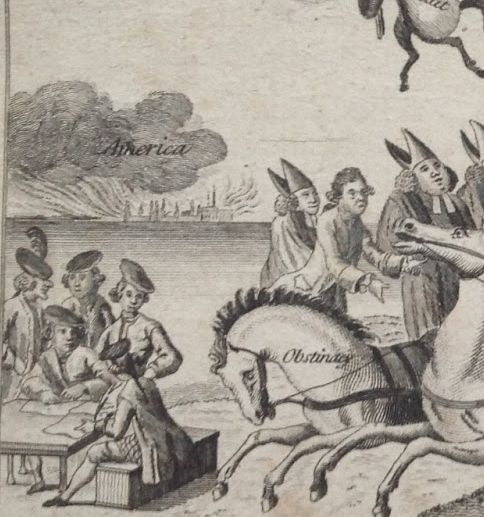 Visitors with an interest in satirical prints will also get the opportunity to watch them produce a copy of Paul Revere’s famous Bloody Massacre… in King Street, as it would have been done 250 years ago. Edes & Gill don’t appear to have a website but here is a link to their Facebook page. The shop is on Unity Street, Boston. If you’re walking the Freedom Trail from downtown towards Bunker Hill, you’ll find it on the left of the entrance to the grounds of the Old North Church. It’s well worth a visit.